We in comics different hero uses their powers to defeat their enemy. One of the comic hero is a superman who uses his x-ray vision to see people behind the walls to see the bad guys. Now the same related thing came to reality MIT researchers in computer science and artificial intelligence laboratory have invented this technique. They have built a device through which we are able to see behind walls. This technology is very old but by using radars in which we use electromagnetic waves we can see moving objects but now through wifi technology this possible. This type of technology ( radar ) is generally used for military purposes. This system is developed by DNA katabi a professor at MIT and her graduated student Fadel Adib. Basically this is a low cost technology, portability and simple enough for anyone to use, that's it's one the amazing benefits. 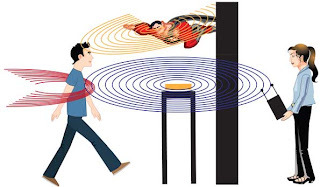 Katabi says" if you feel someone following you or hide behind walls you can use this technology to observe anyone any moving thing " this device also have an ability to detect gestures or movement of body parts behind the walls such as a wave of the arm. Through this technology we can also get benefit in such a way that if we want to turn off the light, we can turn it off by simply moving over arm like in video games we provide gestures this also be the huge possibility of more complex and amazing games. Lets see how it works. This works on Doppler effect a wifi signal is transmitted through device on a wall, some of its radiation penetrates through the walls and some reflected back. Those who penetrate also reflected back by hitting objects. If we cancel all other receiving signals and only receive those which are hitting on the object all reflect back. The same technique used in it that only receive those radiation which hitting moving object kitabi says. Two antennas used in this project and a signal receiver. Both antennas throw the almost signal which is of the same type (either crest or trough), but the signal which is receiving is opposite of nature of the opposite type ( either troughs or crust) and cancel out each others effect,so static object same reflection and cancelled the effect. In this way only moving object's ( human ) signal can be seen.